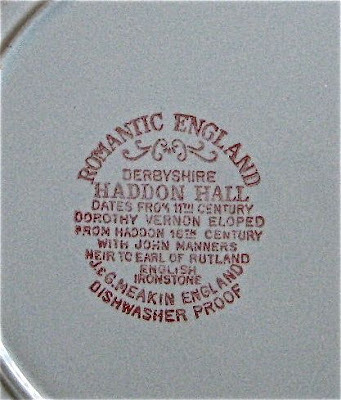 The dinner plate features "Haddon Hall"
The cups feature "Ann Hathaway's cottage" in Shottery, while the saucer features the "Holy Trinity Church" Stratford-on-Avon. These glasses I'm using for juice were a gift from my mom and from the 1970s I think. I do not know the pattern. The coffee pot, cream and sugar are "Bareuther" of Bavaria and part of a set which includes a small tea pot. By the way, if you notice the napkin fold, it should be to the left side and the open corners should all be at the lower right side closest to the forks, although I placed the fork on top because the table is so small. I did not know this until I saw it on a table Susan at BNOTP posted last winter to show incorrect placement. This is done so that it's easier to open. You can see Susan's post HERE. 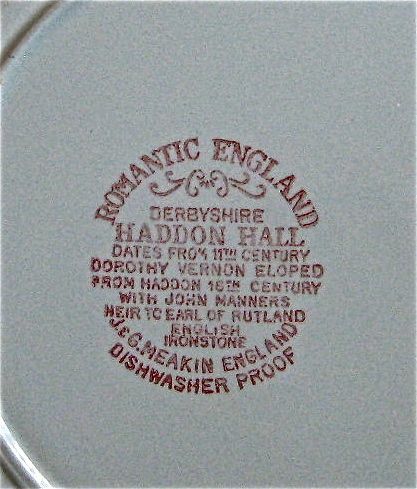 I hope you enjoy this little table with "Romantic England." These are all things I had ready to go and the table really didn't take a lot of time to put together. 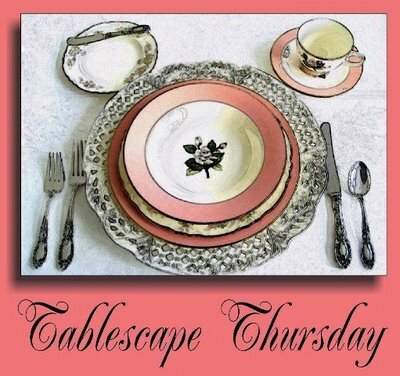 I'll be joining Susan's "Tablescape Thursday" at BNOTP so be sure to stop by!! Such a beautiful table!! 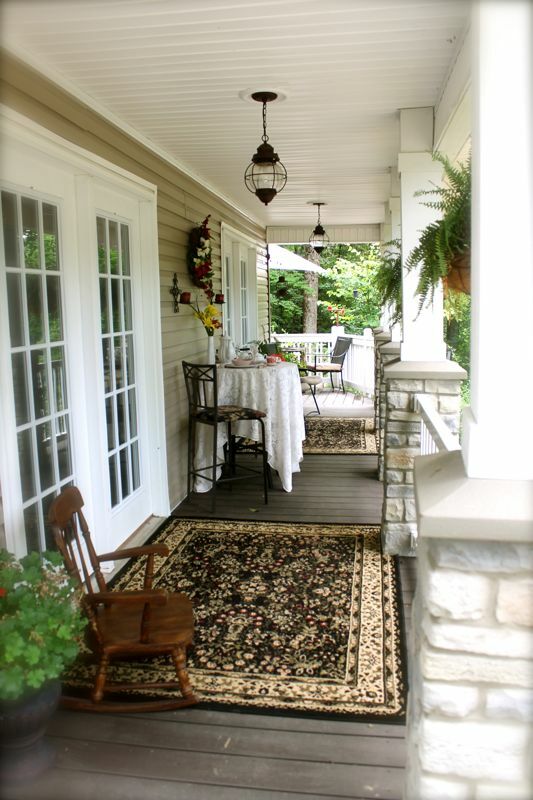 Your porch is so inviting and pretty, too. 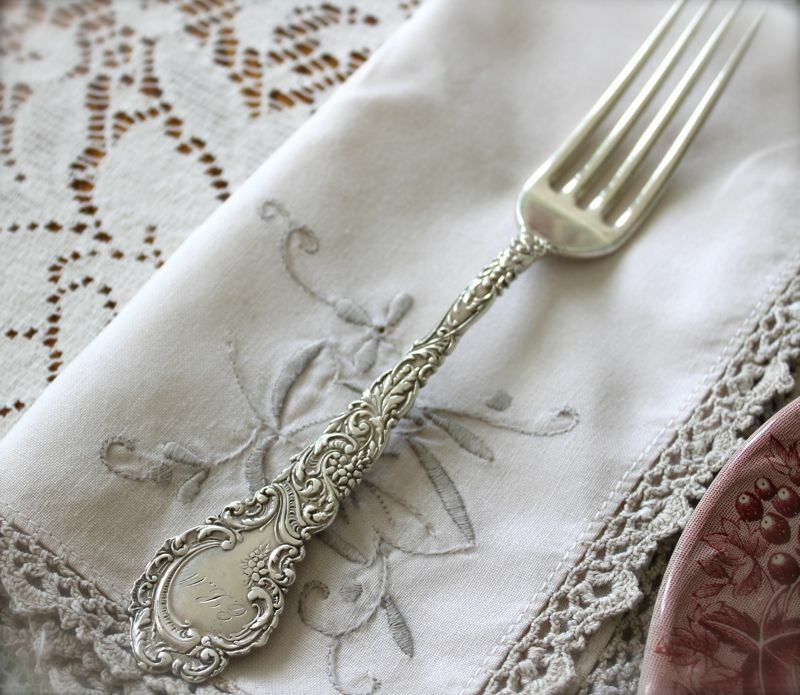 Love the flatware, so detailed and intricate. Anita, this is so pretty and inviting! 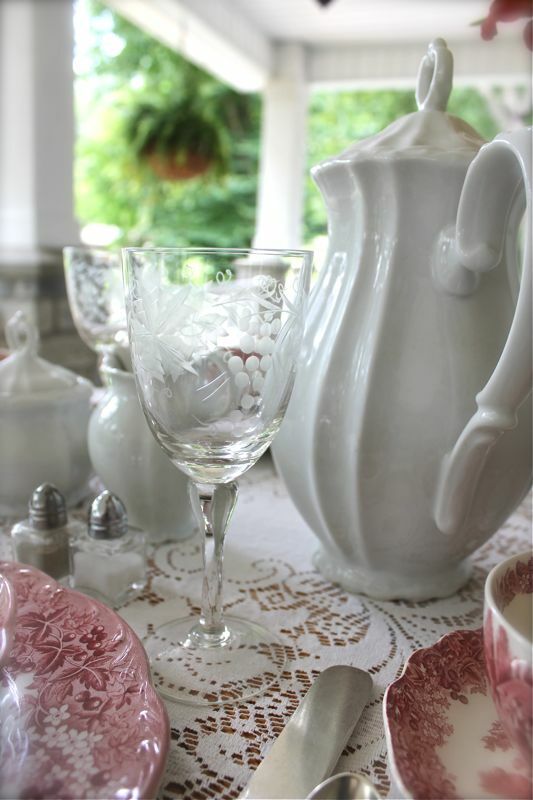 The lace tablecloth is just perfect for the pretty dishes. Thank you for telling us all the patterns and giving us nice closeups! I love your Meakin china! What a sweet little setting you have created. It truly does evoke Romantic England. This truly is a romantic breakfast. Love, love, love the flatware and napkins. They are exceptional. Amazing and so well put together as usual. Those tea/coffe cups are just beautiful! Those napkins are perfect too! If I ever arrived at someone's house and the table looked like that, I would think I had just died and went to heaven. It's beautiful. Love this beautiful tablescape. The red and white dishes are beautiful. Your porch is so refreshing and cool looking. Anita, I hope you are serving scones today. 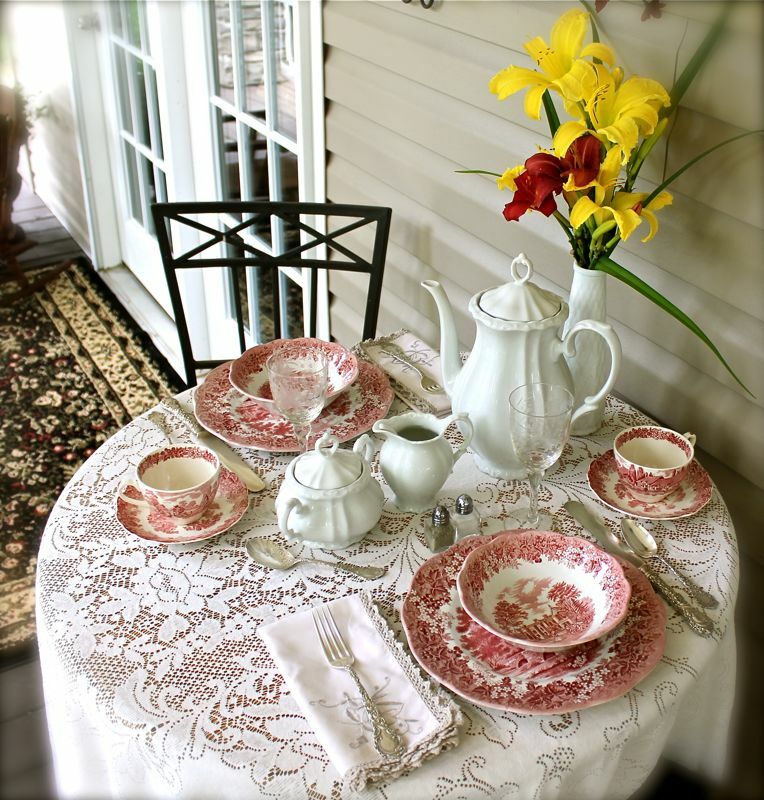 Such a beautiful English table requires nothing less than fresh scones and clotted cream. I'm going to check the mail now and see if my invitation has arrived. :-) Beautiful! 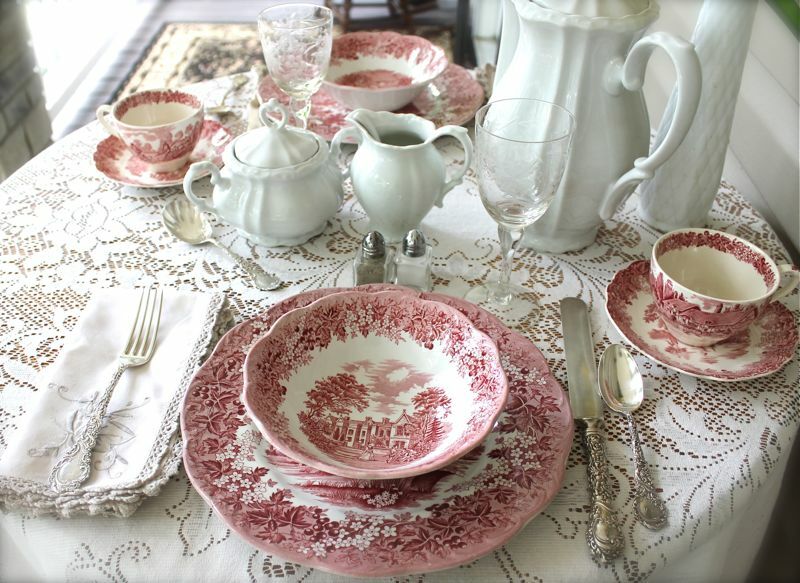 A very pretty table -- I love any transferware!!! Love the tablecloth and your other little touches. 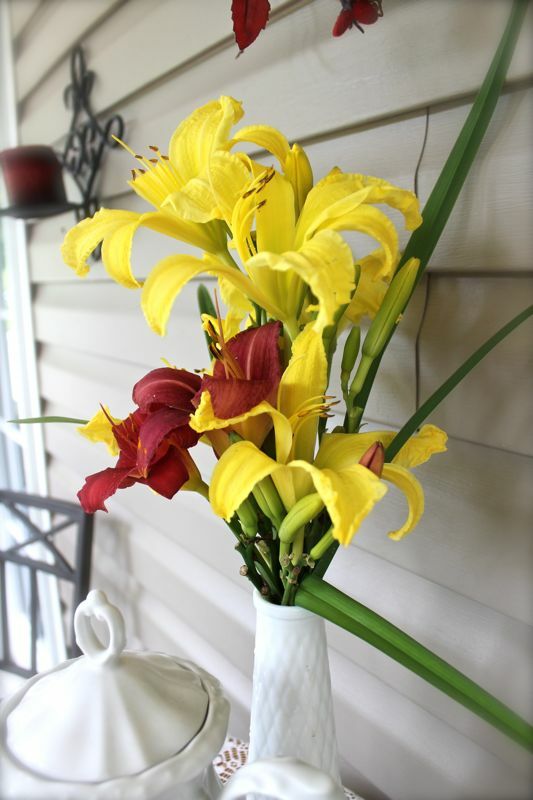 Your table is absolutely gorgeous and I am in love with your porch!! Breakfast on the porch is very lovely. I collect that china so I am right at home here! This table is very much my cup of tea. (Or I guess for breakfast it would be coffee...) It's crisp with the white against the red and has a romantic feeling to it. I love romance. I would love some of those dishes for the rack in my kitchen. Anita, lovely I'll have two sugars in my tea please!SWEET! Anita, Please believe me, my mom has your set of red English dishes and I have been privileged to have the ecru napkins with matching tablecloth about 60 x 84. They are my most special set. I wish we were close by and I could share my things with you! The lace cloth is just gorgeous and romantic like find from a Jane Austen movie. Thank you for always making my day joyful. Hugs, Emelia.I believe my tablecloth was bought in Greece. Absolutely beautiful Anita! Wish I could come sit out there with you. :-) I have some of the plates from that set hanging on a wall and just love them! Wow - I would be out there all day! What a beautiful porch and table! Love those dishes. By the way, I just read your profile and am so impressed! What an exciting life you have! Nice to see you like country music - I am actually going to see Keith Urban tonight!! Hi, Anita! This looks like the perfect setting to take my mind off of things and just relax. I can actually feel myself there, kicked back, a little breeze...aahhh!!! 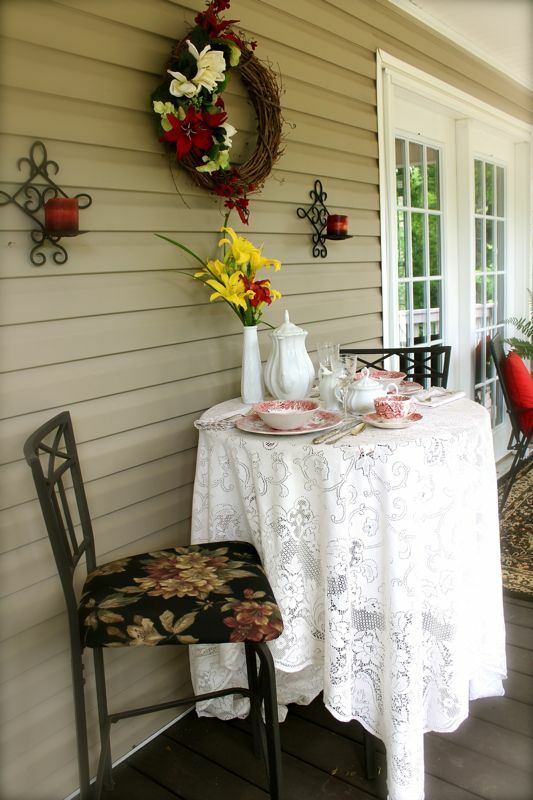 What a great porch to set such a beautiful tablescape. Love the china. I like your blog name! Great visiting you again. It has been a while. I love to read all the blogs but sometimes it gets overwhelming. I haven't entered Tablescape Thursday in soo long and I have missed it. Such an elegant table...perfectly named. 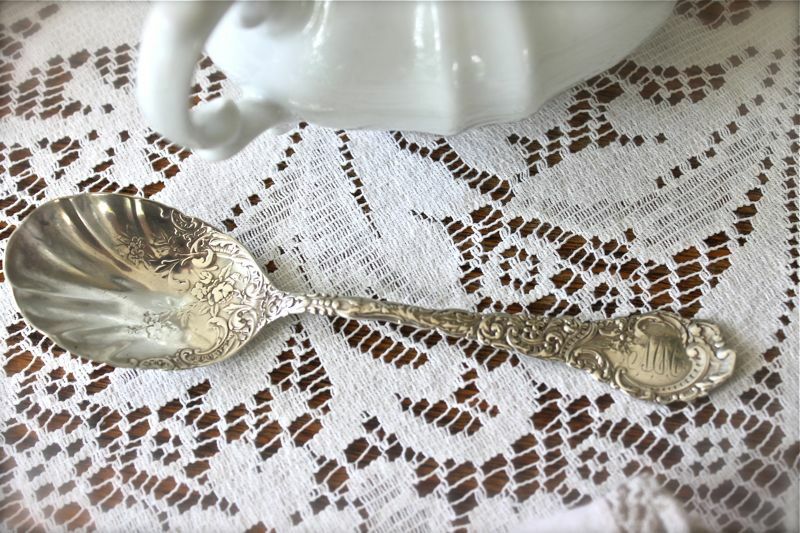 The lace, the transferware, the silver...just beautiful! 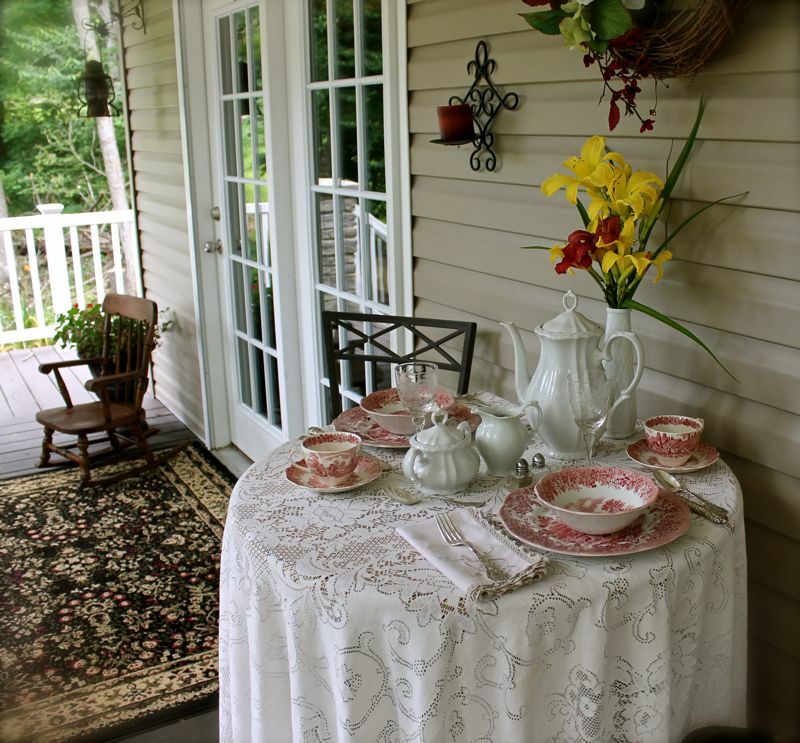 How can you not have a wonderful tea out on such a lovely and charming porch?! I love transferware and your table is gorgeous...the white....the silver....just gorgeous! This is so lovely and romantic! 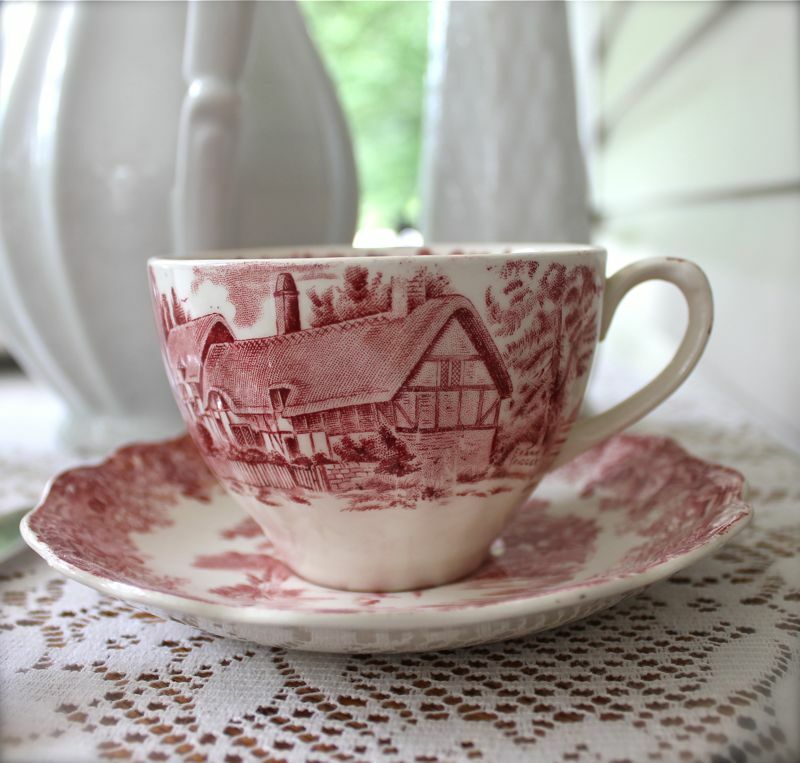 My aunt had china like this ~ it was a more of a "Thanksgiving" theme...but I always think of her when I see similar patterns. I hope you are having a splendid summer ~ today is a glorious day here! Wishing you the same! I have been looking everywhere for a setting just like that as I thought it would be perfect at Christmas time. I love it and I love your gorgeous tablescape too. Hope you have been enjoying summer. Best wishes for a great week! Oh Anita...what a beautiful setting for breakfast! 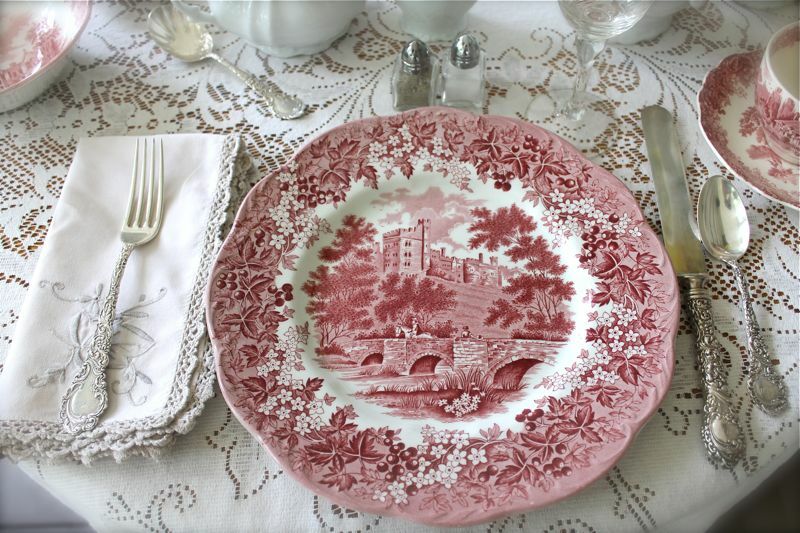 That lace tablecloth is exquisite & so is the pretty pink romantic transferware. The Wallace "Louvre" spoon is Gorgeous! You have so many really pretty things. 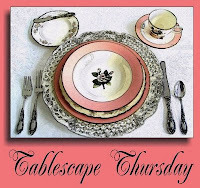 I enjoyed seeing last week's pink table, too, with the depression glass & the "Whitehall" glasses. I have them in clear & know how nicely weighted they feel. Please tell your DD I'm impressed with her photos! She'll be going pro in no time. Anita, What a perfect English breakfast spot. Love your transferware and linens and silver...lol I love it all. PS. Did you know there is a B&B in Staunton, VA that is a reproduction of the Anne Hathaway cottage?